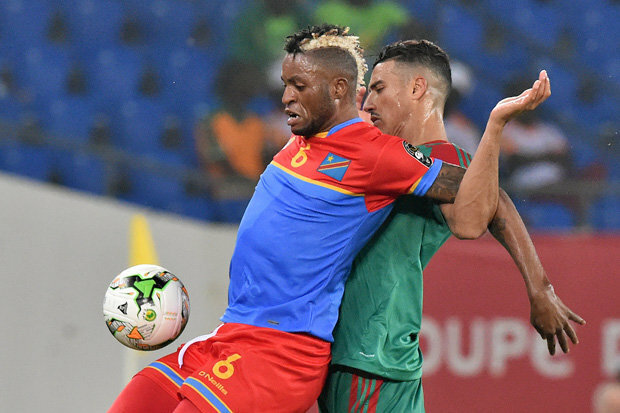 JUNIOR KABANANGA struck early in the second half as the Democratic Republic of Congo secured a 1-0 win over Morocco in their opening Africa Nations Cup match. Kabananga turned the ball home in the 55th minute after FirminMubele’s low crosswas misjudged by Morocco goalkeeperMunirMohamedi who made a poor clearance at the near post.DR Congo played the last nine minutes of the Group C match with 10 men after substitute Joyce Lomalisa was sent off for a second yellow card after only 16 minutes on the pitch. Morocco were denied an equaliser in the closing minutes when DR Congo goalkeeper Ley Matampi made a brilliant stop at point-blank range to block Youssef El Arabi’s header. Ivory Coast and Togo drew 0-0 earlier in the first Group C match.